Autism is a developmental disorder caused by an injury to the brain of a variety of different types, occurring during pregnancy, birth, or early childhood, that results in problems with social skills, repetitive behaviors, speech, and nonverbal communication. Originally deemed a psychiatric disorder, it is now appreciated as an illness caused by environmental factors that interface with various susceptible genes in which inflammation is a dominant component. It is not a genetic disease, however. Like all neurological diseases, the signs and symptoms of autism are dependent on the specific areas of the brain that are injured. Functional imaging studies, e.g. SPECT brain blood flow imaging, have demonstrated that the temporal and frontal lobes are the primary injured areas. Autism is characterized by problems with communication and interaction with other people, and restricted interests and repetitive behaviors, but there is a wide variation in symptoms. Patients are often non-verbal, make little or no eye contact, have repetitive behaviors such as hand-flapping, spinning/twirling, fixating on topics, numbers, moving objects, and lights, hypersensitivity to certain sensory stimulation, sleep problems, irritability, lack of affection or emotion, extremely restricted food choices and sensitivity to food, gastrointestinal pain, cramping, bloating, and even seizures. At the same time, ASD children can have unusual talents and abilities such as phenomenal memory, strong visual and auditory learning, and keen aptitude for science, math, art, and music. HBOT has been shown in multiple studies to benefit the underlying disease processes in autism and thus autism itself. In a large parental review by the Autism Research Institute of all therapies delivered to autistic children, HBOT was rated the 5th most effective of the biomedical therapies. This review is accessible in the link below ending in 19917212. Since Dr. Harch’s treatment of his first autistic child in 1995, he has seen noticeable improvements in 80% of autistic children treated with HBOT. Patients experience improvements in their social deficits, repetitive behaviors, sensory, intestinal, language, and emotional problems. Ben was a five year old boy whose mother had diabetes in her last trimester of pregnancy that was not appreciated by her obstetrician until the time of delivery which was 2 weeks after her due date in 1990. After a prolonged 30 hours of induced labor Ben was born with a grossly misshapen head at 12 lbs. 10 oz. He had meconium staining of the amniotic fluid, a sign of fetal distress, and low APGARS (the grading system used to characterize a newborn baby’s viability). He required resuscitation that resulted in intubation in the nursery. Once home he was clearly abnormal, showed developmental delays, and was eventually evaluated by a neurologist for high muscle tone on the right side of his body, repetitive autistic behaviors, including emotional detachment from his mother and siblings, a learning disability, speech problems, frequent staring spells, and cognitive problems. He showed no socialization (he didn’t relate to those around him). EEGs were abnormal, but an MRI of the brain only showed a small (1/4 inch) clump of abnormal blood vessels that had nothing to do with Ben’s problems. His Childhood Autism Rating Scale score was 29 (clearly on the autism spectrum, but 1 point shy of the threshold used for the diagnosis of overt autism in 1993). 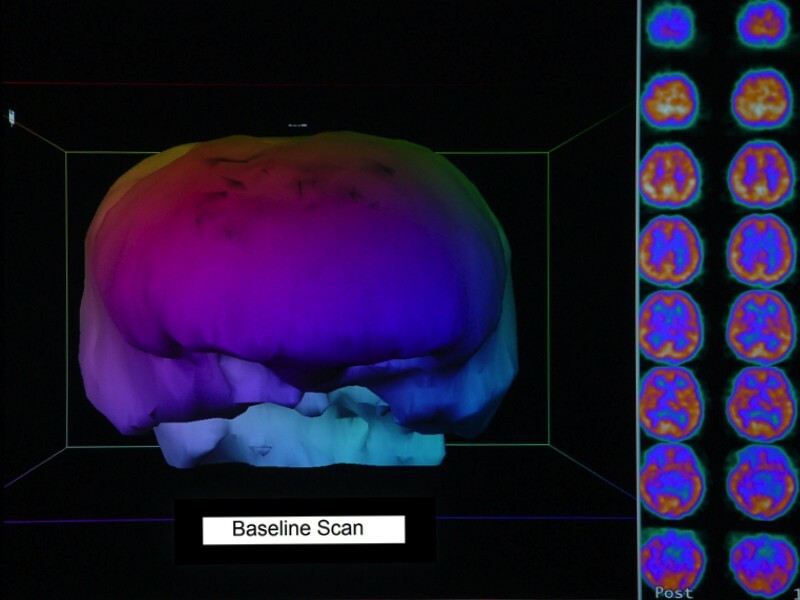 Ben’s SPECT before HBOT: Note the temporal lobe abnormalities, the dominant finding in autistic children, and the cerebellar areas that control coordination (the blue band at the bottom of the image). The slices on the right side of the picture have a coarse texture with multiple colors. 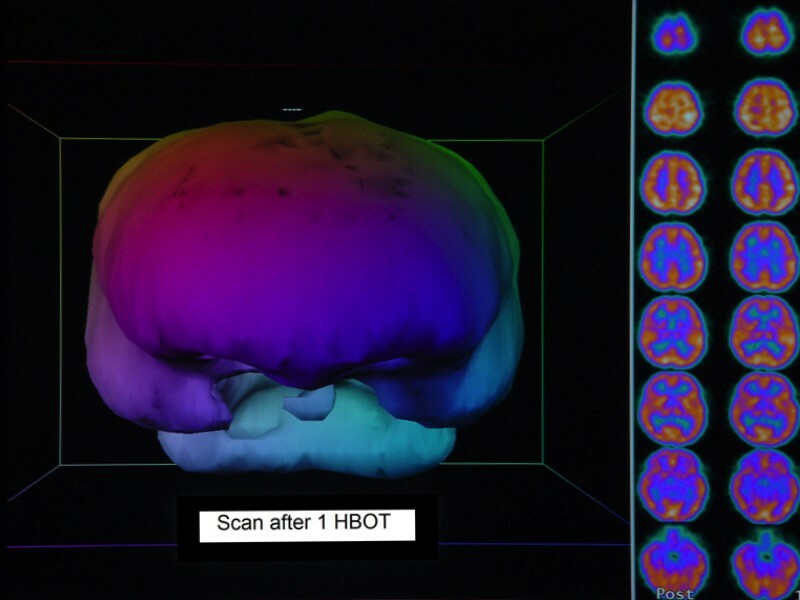 Ben’s SPECT after 1 HBOT: Note the improvement in temporal lobe blood flow and the cerebellum (the light blue area at the bottom of the image). The slices on the right side of the picture are smoother and appear more normal. 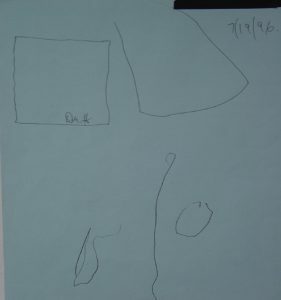 Drawing before HBOT: Dr. Harch drew a square in the upper left corner, which Ben tried to copy. 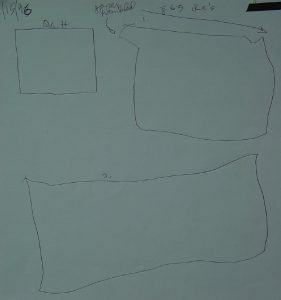 His first attempt is in the right upper corner and second and third attempts are in the lower left and right. Ben’s attempts to copy the square after 35 HBOTs: first attempt is in the left lower corner and 2nd and 3rd attempts in the right upper corner. Ben’s attempts to copy the square after 63 HBOTs: first attempt in the right upper corner, 2nd attempt at the bottom. 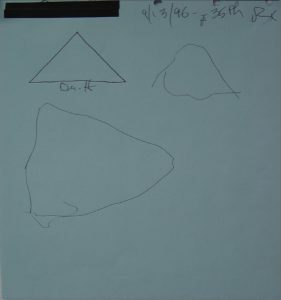 The “glitches” in the first attempt are where the paper crinkled as Ben was drawing. 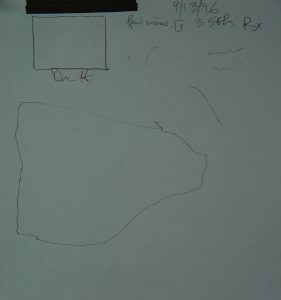 Ben’s attempts to copy a triangle before HBOT: first attempt at the bottom and second attempt on the right. 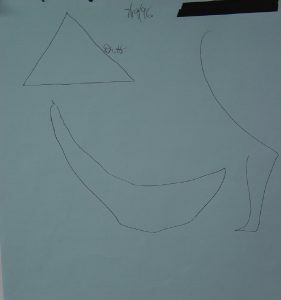 Ben’s attempts to copy the triangle after 35 HBOTs: first attempt at the bottom and second attempt in the right upper corner. 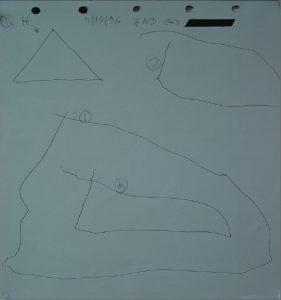 Ben’s attempts to copy the triangle after 63 HBOTs: first attempt at the bottom, second attempt in the right upper corner, third attempt inside the first attempt at the bottom. Whatever your question, get in contact and we’ll give you the answers you’re looking for.